Our visit to Reffley Reservoir on August Bank Holiday Monday afternoon was short but very rewarding. 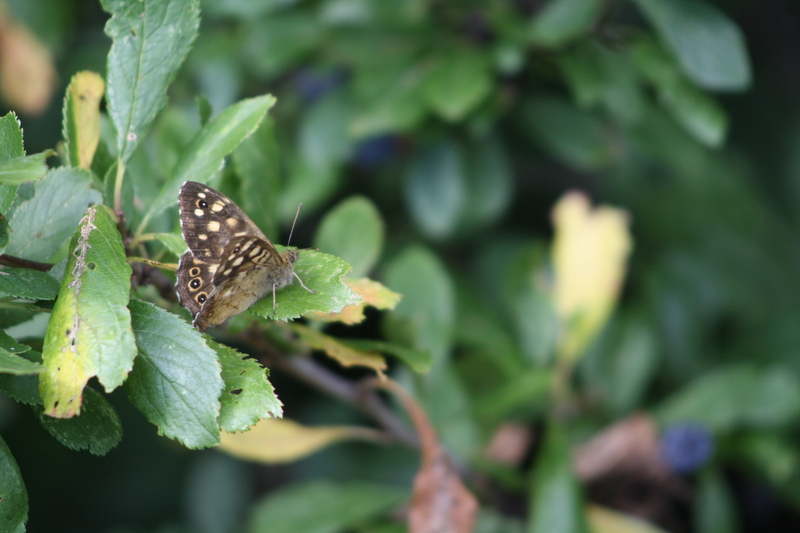 My initial aim was to look out for dragonflies, with a view to using a new app I installed on my tablet the previous night, but after they proved elusive, my attention was taken by the more plentiful butterflies. One of those butterflies gained more of our attention than the rest. My first glimpse was of an orangey insect. But then, as it came closer and spread its wings, it seemed bright yellow. It was flying quickly and fairly low over the wild plants to the side of the Reservoir. My husband thought it may be a brimstone. Fortunately, it did choose to settle for a feed once or twice from ragwort and fleabane and I was able to creep closer to get some photos. It was a butterfly I’ve only seen before in pictures – a clouded yellow! The clouded yellow feeds from a fleabane flower. A migrant, the clouded yellow flies into Britain from southern Europe in the spring. Most years, just a few arrive here, but occasionally the butterflies come in large numbers. Numbers vary according to the insect’s annual breeding success in North Africa and southern Europe. 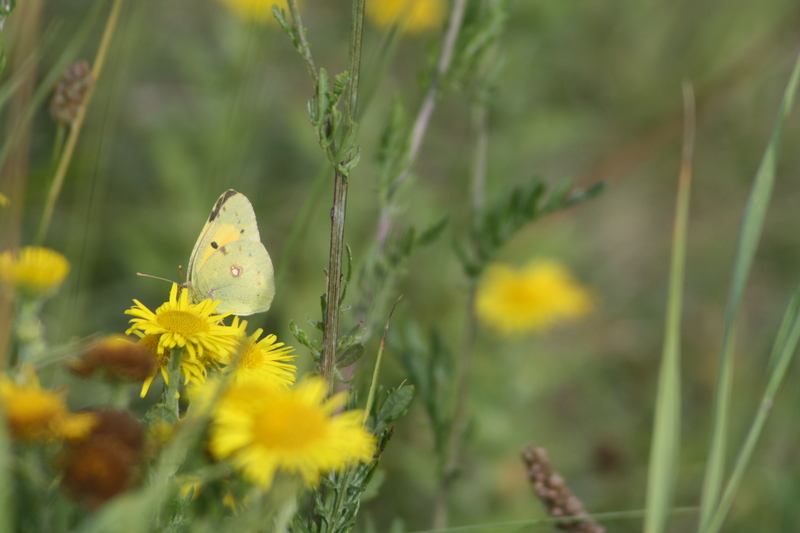 Once in Britain, the butterflies roam around the countryside and lay their eggs on plants such as clovers and Lucerne, and also common bird’s-foot-trefoil, producing locally bred clouded yellows later in the year. Also, we saw several more small tortoiseshells, whose recent absence has been causing concern for Butterfly Conservation. I think they reappeared on the scene once the charity’s annual count had finished! 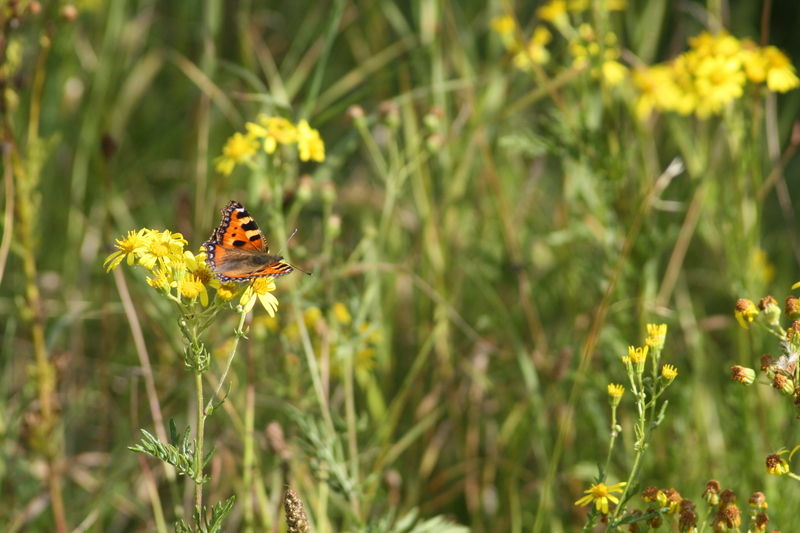 Small tortoiseshells are making a welcome comeback. There was also a comma, a meadow brown, a speckled wood and some whites. I was pleased to see several bees buzzing around the flowers. 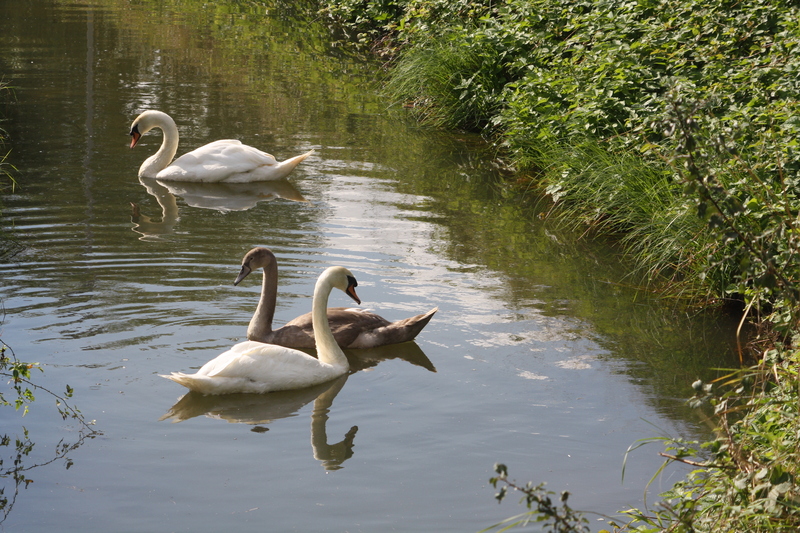 Our visit coincided with one by our local mute swan family. This year, the adults had only one youngster, which is now just about the same size as its parents but still covered in light grey feathers. It was great to see them back in the area. Three coots, all with white shields, also swam into view. The swan family return to the Reservoir. For a grand finale, just as we were about to leave the Reservoir, I heard the tell-tale “keeow” call and looked up to see a buzzard floating, gliding, wings outstretched, far up in the bright blue sky. Even more astonishing – as we watched, another, then another and then a fourth, joined in the flying display! The birds stayed in our view for several minutes. Quite vocal, they sometimes apparently flew close to one another. We believe they were a pair of adults with their two young resulting from nesting in local woodland. As for those pesky dragonflies… I think I saw a brown hawker winging its way back and forth over the early section of the waterway. However, it flew off before I could get my binoculars ready! And a little later, another largish hawker type, this one bluish, flew towards us as we walked along, and seemed to disappear among the reeds, never to be seen again!